I love the look of diaper cakes but was always intimidated to make one and heard that they can be very pricey. 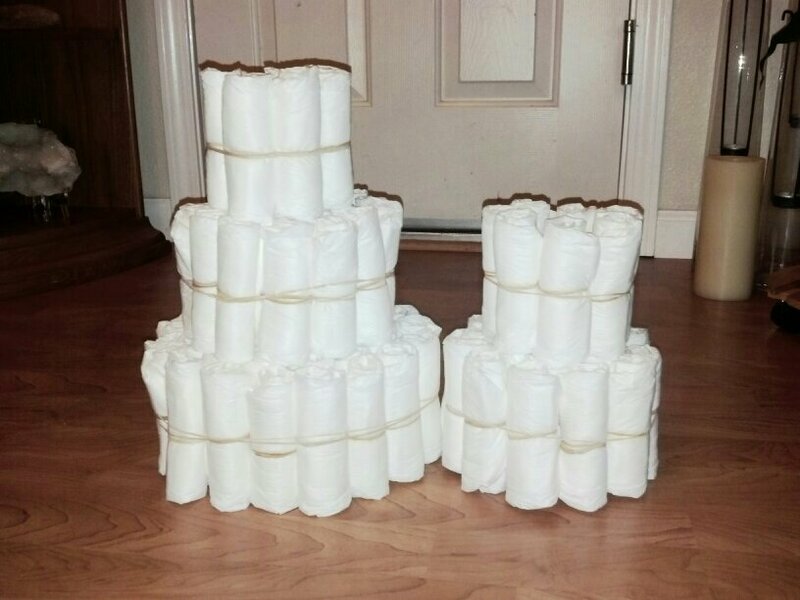 So here are TWO diaper cakes for under $20! First, roll all the diapers starting from bottom and rolling towards the waistline. Secure each one with a rubber band. 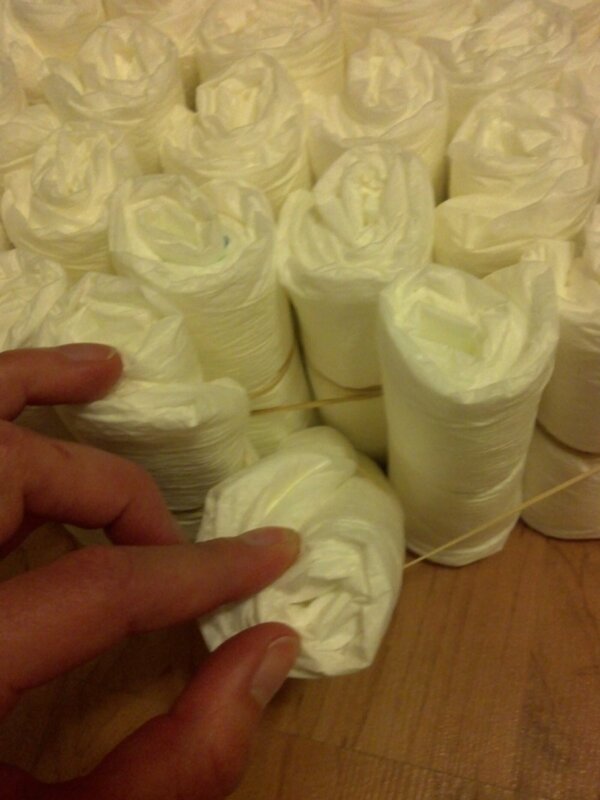 Next, put a rubber band around the baby bottle and tuck the diapers behind the rubber band. I think I used about 5-6 rolled diapers to fully cover the baby bottle. 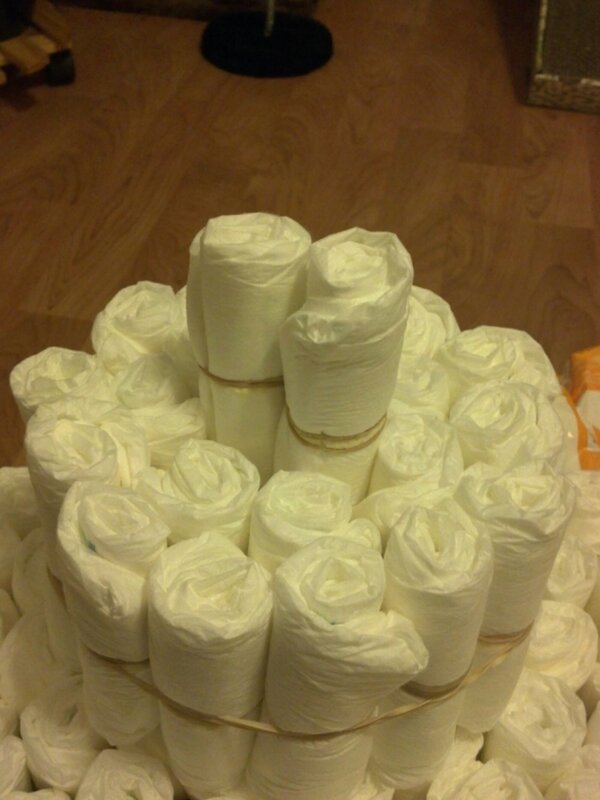 I also did only 3 layers on my base tier in order to get two cakes out of the 100 diapers but you can do more if you like….but won’t get 2 cakes out of it and you may need more than 100 diapers. When you want to add another “round or layer” to a tier in your cake, you will new to put another rubber band around the diapers. This will make each layer very secure where you will be able to pick up the cake without having to have cardboard under the cake. For your second tier, part of the bottle will be covered leaving a hollow-like center. For the top tier, place 2 diapers in the the hollow center in order to finish your third/top tier. For the second cake, take the other baby bottle and do the same method as the first cake but just do 2 tiers. 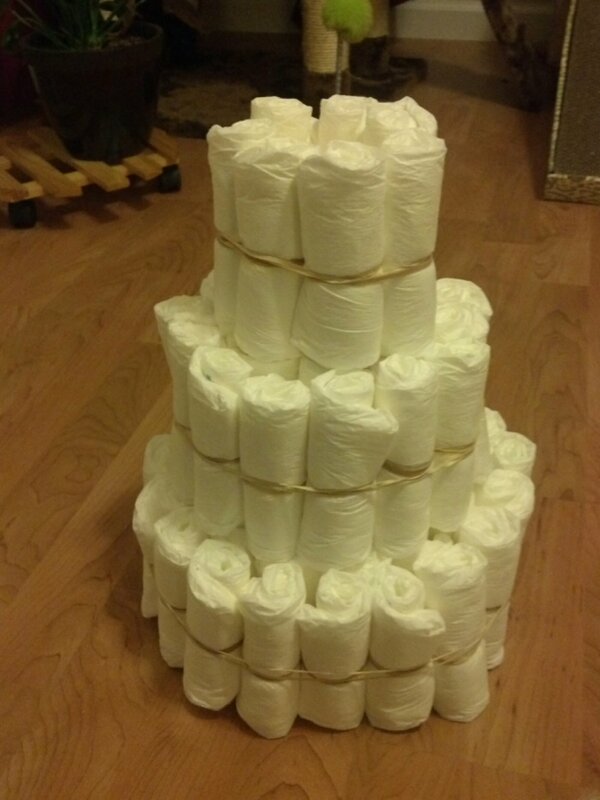 The first cake uses about 66 diapers while the smaller cake uses about 30-34 diapers. The smaller diaper cake would be a great centerpiece as well. Just unscrew the top the bottle and you can even use the bottle as a vase. Some people also place travel size toiletries, stuffed animals, pacifiers, etc. in the cake as part of your gift.